Coffee Stirrers Machines is combined by the following machine : rotary cutting machine, tri-carved cutting machine(triple punching cutting machine), drying and polishing machine, selecting machine, chamfering machine, branding machine, bunding machine, packing machine. These machine are same with ice cream sticks making production line. 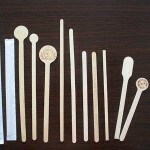 Customer just change the mould and can get wooden coffee stirrers machine. Double segment rotary cutting machine applies to process round wood material. It can adjust easily, low noise, easy operation, good rigidity and high efficiency. So it is widely used in wood processing. Feeding parts adopt ferro-bronze and lead screw is made of 663# abrasion-proof material. Adopt transducer and other high-performance numerical control components. The machine works stably and safely. This machine is suitable to process birch、poplar、eucalyptus、pine and other wood materials. This machine is used to cut the wood board into certain shape wood chips. The wood chips shape is adjustable and only need to change different moulds and gears. The machine installs safety protection system, it can protect the worker and ensure the machine operate smoothly. Coffee Stirrer Bundling Machine can bundle coffee stirrer into different pieces according to customer’s requirement. It don’t make any damage to the plastic surface, Romiter Group has export Coffee Stirrer Packing Machine Machine to Bulgaria, Brasil, Ukraine, Russia, America, Chili, etc.